I love a delicious, complex cocktail as much as the next guy but sometimes you just want something that’s a little more simple. Rugged. Or even rough. Thankfully, I live in Hollywood so I have plenty of selection to suit my needs and desires of the moment. And yeah, I was craving something a lot less maintenance than a $14 hand-crafted cocktail plus an easyÂ snack that would satisfy my belly. So I decided to check out Frysmith’s new cover band, Loaded Rock Bar on Hollywood Blvd, which serves up their menu without the gas ‘n go truck and with the stationary bar seating, lone flatscreen andÂ nostalgic-to-the-80’s, rocker-esqueÂ soundtrack. 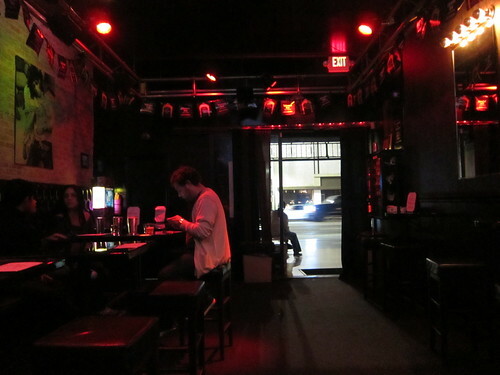 I’ll admit: The key is visiting on Call Whiskey Wednesdays, whereby all call whiskey is $3 per shot (If you prefer Jager, go on Mondays; tequila and Tecates, go on Thursdays). 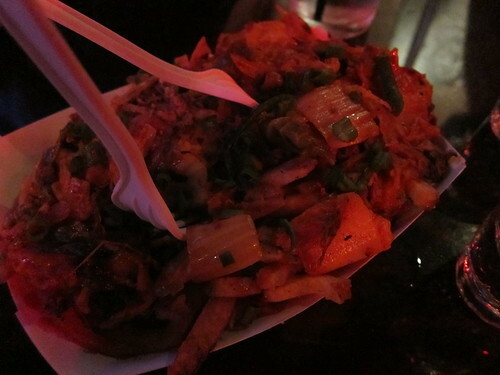 And so Makers it was, for me, which accompanied an order of Loaded Kimchi Fries with pork belly. Beautiful. The fries were of a perfect crisp and the kimchi was more respectable than I’d honestly give a rock bar credit for.Â It would be hard to say if they’d be even better if cooked on the original truck. Thank you, Loaded, for proving me wrong. It’s apparent that the place provides its customers with a solid bar-going experienceÂ without the BS. They also have a cheapÂ food menu besides theÂ Frysmith menu, which I have yet to try, but which also comes with little risk ($5 for a burger on Hollywood Blvd? Wow!). But if you’re not hungry, count on Loaded for the whiskeys and bourbons – including evenÂ Death’s Door White Whiskey, Woodford Reserve and Basil Hayden ($7 ea). Or Macallan 12 for $8, if you were thinking something sweeter. Highland Park 12 and even Balvenie 12 are even $8 per pour. ThinkingÂ about fitting in? A $5 PBR 24-oz pounder should be right up your alley. If you want to play middle-of-the-aisle, they also have $4 bottled Red Stripe. Are you a daytime drinker? All drinks are 2 for $1 more from 11 AM – 7 PM. Whoa. 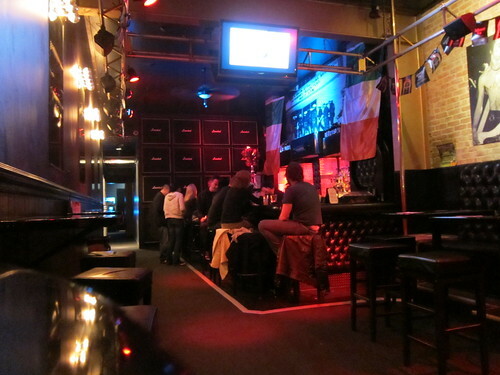 Not bad for a rock bar with fake Marshall Loaded ampsÂ lining the back wall. This entry was posted in beer, cocktails, Food, Food truck, Hollywood and tagged $3, @loadedrockbar, bar, bourbon, dive bar, drinks, fries, Frysmith, Hollywood, Hollywood Blvd, Loaded Bar, Loaded Rock Bar, rocker bar, scotch, shots, whiskey. Bookmark the permalink.